In recognition of World Food Day (October 16), Yum! 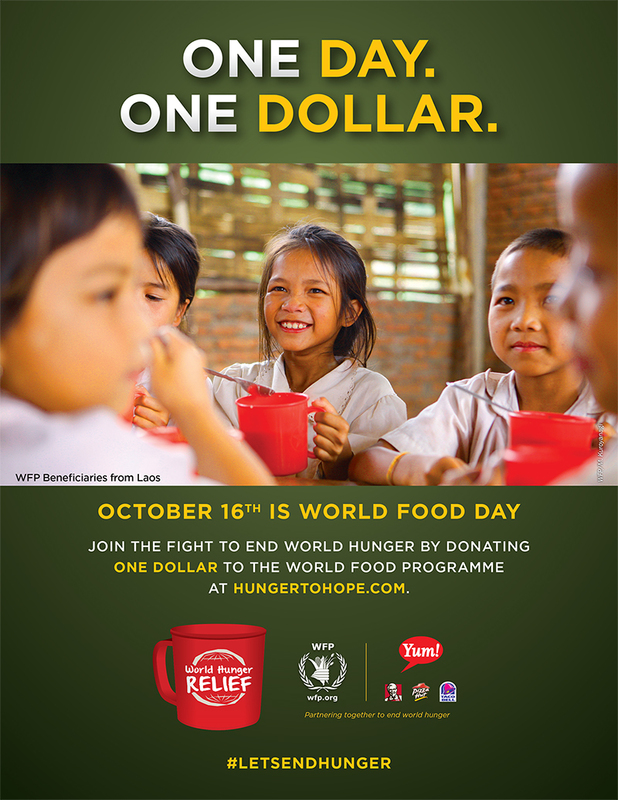 Brands, parent company of KFC, Pizza Hut and Taco Bell and its millions of employees around the globe show their Huge Hearts by donating at least $1 to the World Food Programme at hungertohope.com. Each dollar contributed provides four meals to the people who need help the most. At Yum!, every donation counts, and as the defining global company that feeds the world, Yum! 's employees truly care about the world. Together, Yum! and its employees, franchisees and their families volunteer millions of hours to aid hunger relief efforts in communities worldwide. For more information about Yum! 's World Hunger Relief efforts or to join the movement, go to hungertohope.com.